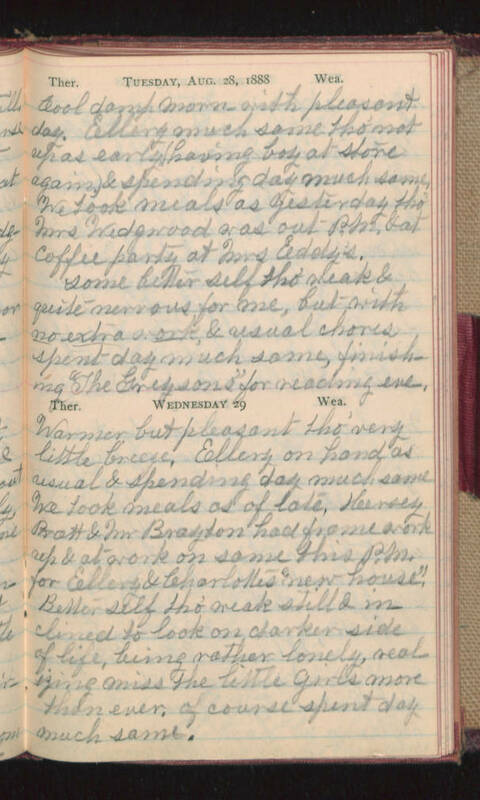 Tuesday, Aug. 28, 1888 Cool damp morn - with pleasant day. Ellery much same tho' not up as early (having boy at store again) & spending day much same. We took meals as yesterday tho' Mrs Wedgwood was out P.M. & at coffee party at Mrs Eddy's. Some better self tho' weak & quite nervous for me, but with no extra work, & usual chores spent day much same, finishing "The Greysons" for reading eve. Wednesday 29 Warmer but pleasant tho' very little breeze. Ellery on hand as usual & spending day much same. We took meals as of late, Hersey Pratt & Mr Brayton had frame work up & at work on same this P.M. for Ellery & Charlotte's "new house". Better self tho' weak still & inclined to look on darker side of life, being rather lonely, realizing miss the little girls more than ever, of course spent day much same.